The Green Gorilla ProLine Vi series features a patented Power Pack X that easily attaches to the tank with a simple push and click. Rotate the knob counterclockwise to remove the Power Pack X while the tank is still under pressure. Change it to another tank, allowing for increased productivity. Every unit is fully tested and precisely calibrated to control tank pressure within 2 psi of the optimum pressure (using trademarked Smart Pressure Technology). The company notes that this can save technicians up to 25 percent in application time. Available in either a 1.5- or 2.5-gallon size. 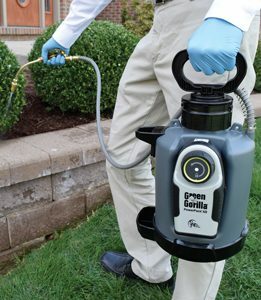 Purchase a Green Gorilla Pro Line Vi Sprayer between Oct. 1 and Oct. 31, and receive a free shoulder strap ($30 value).